The full name and model is the Weber 51060001 q1200 liquid propane grill. But in this Weber Q1200 review we have seen that people use a lot of other names for it. The Q1200 is the in 2014 updated version of the Q120. It is great for camping and tailgating. The option to use the Weber 6557 cart makes it also available as a stationary grill for your backyard or patio. Many users like it on their balcony because of the limited space it uses. TIP! If you can find this Weber Q1200 for under $200 GRAB IT! I have seen it on sale for this. Find the current price here! The q1200 is the newer model of the q120 model but still got all the same features. The new model is re-styled with a little more modern look. The updates also include some ergonomic changes. The grip handles are bigger and so do the control knobs. The logo of the Weber company in now branded in the lid. The side tables are made more sturdy and also made a little larger. The fold out option of them will safe space when you store your grill. Although this is a video of the old Q120 it still shows all the features. I will try to find an updated Q1200 video and show it here. This Weber q 1200 portable propane grill uses the 14.1 or 16.4 liquid propane cylinders but with the use of a adapter hose (see my recommendations for that here) you can hook it up to a larger propane gas tank. With the Weber q1200 dimensions of 40.9″ x 20.5″ x 24.6″ and a weight of 28.8 lbs I think we can still consider this a portable gas grill. For the ones who like to color coordinate the grill with their patio or deck this Weber Q1200 grill comes in the following 9 colors. Fuchsia, Black, Blue, Green, Orange, Purple, Red, Titanium and Florida state university maroon. Don’t ask me why that last color is named after an university because I go no idea. With the lid closed there is 4 inch space in the middle left between grate and lid. Maybe not enough for a chicken but enough for most other foods. One of the first things to know about any grill is how much grill space it has. This Q1200 comes with two grill grates that each are about 8 x 12 inches and this bring the total usable grill surface roughly to 189 square inches. With a need surface of 72 sq inches per person if you grill meat and veggies at the same time you can accommodate 3 people with this grill. Since most people use it just for meat and maybe a few side dishes I think I can say that this grill will fit a family of 4 with no problems. The grill grates are in two pieces this means you can replace one of them with the griddle to make eggs, pancakes or anything else you like to cook on a griddle. It took me a long time to read many of the customer reviews. Not because I read slow, but because I found so many of them. If I take the averages I come to the following numbers. 94% of the buyers gave it a 4 and 5 star rating. I always like to start with the lower ratings to see if I find something they all have in common. This time I could not find many negative reviews in the first place and the ones I found were talking about some problems that are not related to the overall quality but more production errors and shipping problems. Thing like a not working regulator and a bend leg under the grill. With only 2% bad ratings I think we can call this not bad. I can however imagine that if you receive a grill with a defect you are not happy and will give it a bad rating. If you like you can read all customer reviews and ratings here! The average ratings (3 stars) write about some problems with attaching the gas bottle and it being in the way of the lid. In the higher ratings I can not find anything back about this and this makes me believe it is a production error or a user error. Other remarks were that they expected a thicker metal, grill not getting as hot as they thought and food sticking to the grill grate. The 4 star rating I read mentioned a few times that the flame will be blown out in a windy situation. One person mentioned that if he picks the grill up the control knob is right under the handle and making it hard to get his fingers around the handle. For the rest I only found a few very personal complaints like: A little heavy to carry, grill surface is too big for me, temperature hard to maintain at a certain level, nor easy to unpack out of the box and more little inconveniences. No major complaints. The 5 star ratings Many people recommended this grill for balconies of apartment buildings and others called it the best grill for camping and road trips and for use in the RV because it does not take up to much space. On average it takes about 8 minutes for the grill to heat up and this is pretty standard in my opinion. TIP! Read all customer reviews here! After reading a ton of reviews and comments of people who bought and used this grill and reading on some of my popular forums I can only recommend this grill as a great grill. Even if you just use it for camping or an occasional BBQ at home for a few people it will fit your needs. Why some people call it the Weber baby q1200 I don’t understand since it is not that small. The reviews I found are in most cases very positive and the complaint I found are in my opinion minor. Although I realize that if you have one of them it can be very annoying. If you are in need of a larger or smaller Weber you can always have a look at all our Weber grill reviews. What I personally like about this Weber Q1200 and most Weber Q grills are the porcelain coated cast iron grill grates. In my experience the cast iron retains the heat very well and the porcelain coating prevents sticking and makes them very easy to clean. With the options to place the Q1200 on the grill cart you can convert it pretty easy in a fixed grill and you do not need a separate grill or prep table. But if you still like to have one we did some nice reviews of patio grill tables for you. if for some reason you are no fan of the Weber company and like to see some other options before making a final decision you can look at the portable gas grill reviews we did. TIP! You can find the lowest price here! Like always we try to find items and product to make the use of any grill easier and a more total experience. For the Weber Q1200 we found the following products and ideas. Like all new grill start it and let it get hot for about 20 minutes to burn of all the oil and grease that is use during the manufacturing process. This is also recommended in the Weber Q1200 manual. I always like to season any new grill with spray on butter or just brushing olive oil on it before turning it on the first time. 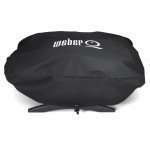 Like always we recommend the use of a quality grill cover for a grill and the Q1200 is no exception. We have found the 6553 for to protect your Weber from all weather and make it last for many years. Like for any grill, cheap or expensive we recommend the use of a quality grill cover to protect your grill form the elements and make it last longer. 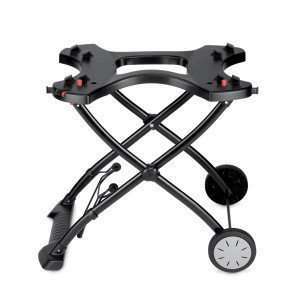 This Weber q1200 stand can be used only with the Weber Q1000 and Q2000 series. It is very durable and can be folded for easy transport of your grill. The grill slides in from the front and locks in place. For transportation the two straps keeps the grill well in place. One con is that it does not have any side-tables, but you have to use the one on the Q1200. The 6506 griddle you can be used to replace one of the split grill grates and used on the q120 and the newer q1200 for breakfast cooking. Eggs, pancakes bacon and all other breakfast items will cook great on this griddle. Fits well on the Weber 1200. 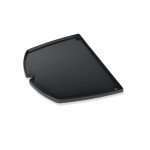 The drip pans for the Weber Q1200 and other models are very cheap and available on line. Order some when you order the grill. 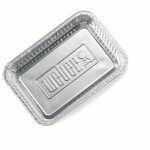 Some grocery stores also have aluminum pans available in this size. An other option is to buy a stainless steel drip pan and line it with aluminum foil. Of course you can have a look at our grilling accessories and find more items to improve your grilling experience. I hope you enjoyed this Weber Q1200 review and have found it useful. If you have anything to add or feel that our readers need to know about this grill leave a comment below.